There’s nothing quite like growing Cryptanthus or for that matter, any bromeliad from seed. It’s an incredible feeling, watching a tiny, hard little seed grow up into an adult! On the other side of things, it’s really inexpensive way of increasing your collection and makes for good trading material! 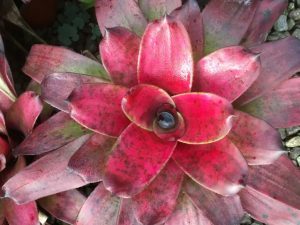 I read all I could on bromeliad seed growing, which not only wasn’t much, but was confusing and a bit daunting, what with every different type of seed needing different soil, light, etc. I simply don’t have the time, or the room, to give each seed group individual care. At $1 for a pack of seed, I decided to try, anyways, using my own, very simple method. I use this method for all bromeliad seeds except Tillandsias. 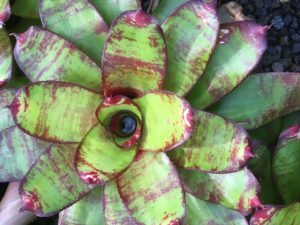 I sow my bromeliad seed on the same mix I use for the adults – 50% Canadian Peat and 50% Perlite, wetted with warm soapy (Ivory) water. Warm, soapy water will dampen the peat evenly and quickly. This mix is placed in a flat tray, to a depth of 2.5 cm. Seeds are placed on top of the mix (in groups by species, or hybrids) and plastic name tags placed beside each group. I sow Dyckias, Neos, Orthos, and Cryptanthus all together in each tray used. I prefer trays with drainage holes, as I can then bottom-water by placing the tray in the bathtub. Fill your bath with warm soapy water, or use the water that remains after you’ve had a bath. This “used” bathwater is called “grey water” and is very good for plants. The soap residue acts as a natural insecticide and fights bacteria. Again, the warm, soapy water will also evenly dampen the mix. Next, I place a clear plastic lid over each tray. Having for years grown other plants by seed, I knew what difference bottom-heat can make. I hadn’t heard much about using bottom heat on bromeliad seeds, but I gave it a try and the results were spectacular! Germination can start as quickly as one hour from sowing, and all seeds are usually germinated after three days. I used to use an electric heating pad, but one, it’s electric and the seed tray is damp, and two, a friend sent me so many seeds knowing that I didn’t have the heart to throw out the excess, that I was sowing 8 or 10 trays at a time and heating pads aren’t cheap! Looking around, I realized my King-size water bed could easily hold 10 trays of seed…. So they got the waterbed, I got the couch! I keep the bed at 26 degrees C, place the trays directly on the mattress and cover them with a white cotton sheet. After 2-3 days, everyone should be germinated and the sheet can be removed. After two weeks the trays are placed on the plant shelves under artificial light and treated as adults, but still bottom-watered. At three weeks, the seedlings are potted up individually and their adult life begins! Mix 50 % Canadian Peat and 50% Perlite. Dampen with warm, soapy water, fill a tray to 2.5 cm depth. Sow seeds on top, do not cover with soil. Cover with a clear plastic lid. Place on waterbed mattress and cover with a white cotton sheet, for 2 – 3 days. Remove sheet, provide some light. After 14 days, place seedlings trays with adults. After 21 days, pot up individually. 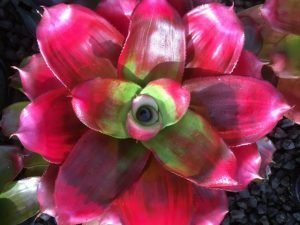 It may be a weird way to grow bromeliads by seed, but it’s quick and easy and very inexpensive! (if you don’t have a waterbed, children’s sizes are very inexpensive, and if you later decide not to grow more seed, the bed liner makes a great garden pool!). 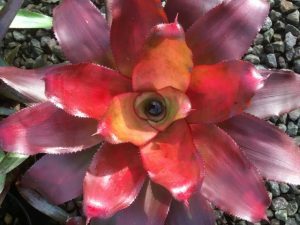 Note: Taken from Central Coast NSW Bromeliad Society Inc. Bromelia Post – January 2005.